Proper food handling and implementing the HACCP (Hazard Analysis and Critical Control Points) management system is important to ensure that the fresh produce we are consuming is safe to consume and is also free of threatening pathogens. Not only does is this protecting our health and well-being, but it also helps in avoiding costly recalls for suppliers. From small farms to large industrial operations, wash water is utilizing itself to eliminate food-borne illnesses, remove dirt and debris. In addition to this, the water used to irrigate crops must also be disinfected to prevent any type of contamination occurring before harvesting. The wash water must be monitored to ensure it contains proper levels of disinfectant. A common disinfectant is sodium hypochlorite (NaOCl) due to its low cost and effectiveness against a wide range of contaminants. In water, chlorine forms hypochlorite ions (OCl–) and hypochlorous acid (HOCl). Additionally, hypochlorous acid is the more effective disinfectant between the two. Together these are called free chlorine which are measured in parts per million (ppm). An amperometric sensor can be used directly to measure ppm of free chlorine. Free chlorine reacts with organic and inorganic substances to form combined chlorine, which creates byproducts such as chloromines. It is important to monitor the wash water either by sample measurement or continuous online measurement, to ensure enough free chlorine is present to react with any contaminants. For example, a standard wash cycle may have three stages, with 100 ppm, 50 ppm, and 5 ppm of free chlorine, respectively. The pH of the wash water should also be monitored considering that it influences the sanitizers effectiveness. As the pH value rises, the availability of hypochlorite ions making up free chlorine also increases, while the availability of the more effective hypochlorous acid decreases. If the pH happens to be above 8.0, the chlorine loses the majority of its disinfection capabilities. As the pH drops, more hypochlorous acid becomes available and the disinfection effectiveness will increase as a result. As the pH drops to exceptionally low values, free chlorine will exist as chlorine gas which is considered very hazardous. The target pH is 7.0, with an acceptable range for wash water approximately 6.5 – 7.5 pH. There are a variety of electrochemical sensors available to utilize a glass bulb or flat glass membrane to directly measure the pH. Chemicals, such as muriatic acid (HCl) or citric acid (C6H8O7), are added to the wash water in order to help control and stabilize the pH value. Chlorine is not the only disinfectant used in producing wash water. Other components such as bromine, ozone, and hydrogen peroxide can also be utilized. A different approach is necessary in order to monitor this wide range of options. Since all chemicals mentioned above are oxidizers, ORP (oxidation reduction potential) can be used to monitor the activity of the sanitizer rather than the concentration of each one in particular. The oxidation level is measured in millivolts which also relates to the activity level of a sanitizer being present. A value of approximately 750 mV is sufficient enough to kill microbes such as E. coli, yeast, and mold. 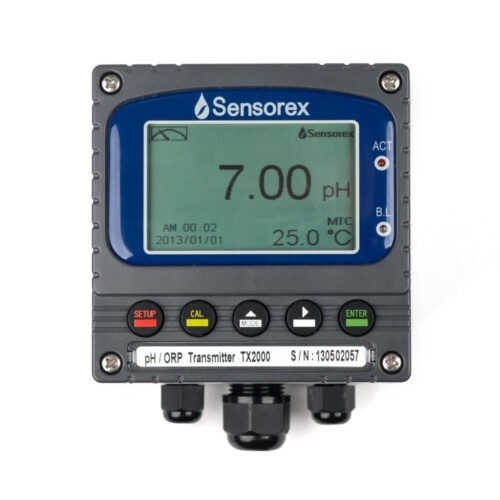 Although an ORP sensor does not measure the sanitized concentration directly, it provides an accurate indication of a sanitizes effectiveness. These electrochemical sensors use a platinum measuring surface to detect the ORP. Continuous monitoring of the parameters described above is a common practice for producing washing operations while using industrial machinery. The measurements verify food safety and can also be fed into control systems that automatically add chemicals as-needed to maintain pH and sanitizer levels. Proper wash water monitoring results in fresh produce being safe for consumption, efficient use of chemicals needed for disinfecting, and avoiding costly product recalls.